What’s orange and creamy with black all over? Grilled Sweet Potatoes! Don’t let our sweet nature fool you – sweet potatoes can take the heat! Famous for our long-standing appearance on holiday dinner tables, most are surprised to find that sweet potatoes are actually a year-round vegetable. When the temperature starts to warm up, we love to grill sweet potatoes. Sweet and creamy on the inside, charred and crunchy on the outside – what’s not to love? 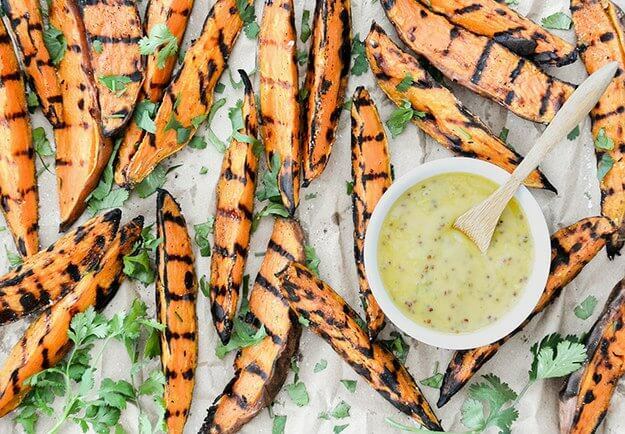 From wedges to rounds, planks to cubes, Grilled Sweet Potatoes come in many forms! Here are some tips on how to cut sweet potatoes to your liking. Just before putting on the grill, season sweet potatoes liberally with salt. Place sweet potato wedges directly on the cooking grate over direct heat; grill until well-marked, about 3 minutes on each side. Move to indirect heat. Finish cooking, turning halfway through, until soft and tender, 20-30 minutes. Remove from grill. On a rack fitted into a baking sheet, place sweet potato wedges and season well with salt. Bake until tender and browned around the edges, about 30 minutes.